As the Great Recession drags on in California — unemployment rate: 12.4 percent, state government in a state of collapse — the solar boom continues. The Golden State’s decade-long program to install 3,000 megawatts of photovoltaic arrays on residential and commercial rooftops kicked off in 2007, not too long before the global economic collapse began. 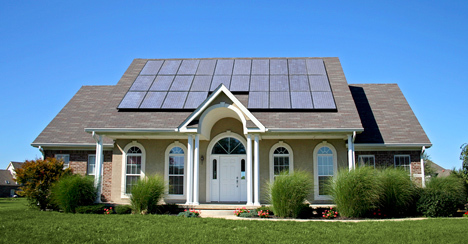 Demand for solar is accelerating even as the housing market remains in the doldrums. Applications for the solar rebate program hit a high of 134 megawatts in April, and in the first six months of 2010 a total of nearly 300 megawatts’ worth of projects were received. “The monthly demand for new applications has been well over 1,000 applications per month for the past year,” the report stated. And Californians’ appetite for solar has grown even as the rebate for new photovoltaic systems has declined, as it is designed to do over the life of the program. But one of the biggest factors persuading Californians to go solar appears to be the increasing availability of solar leases. These financial arrangements allow homeowners to have a system installed at little or no upfront cost in exchange for a monthly fee. 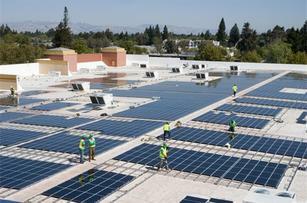 Companies such as SolarCity, Sungevity, and SunRun offer solar leases and retain ownership of the rooftop arrays. 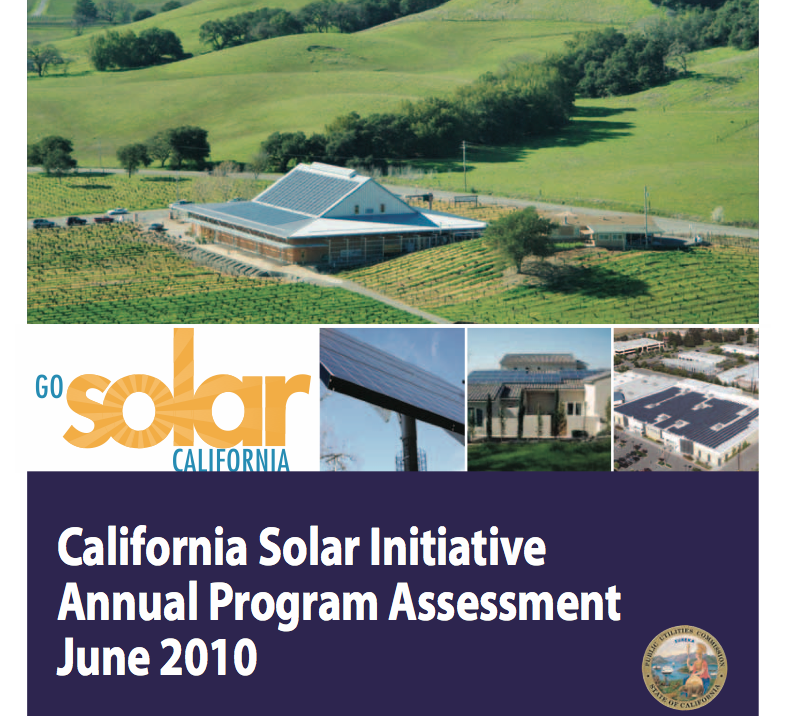 In 2009, such ownership of solar systems enrolled in the state program jumped 155 percent. Forty percent of the megawatts now generated through the program are owned by leasing companies or other third parties. Fueling that trend has been the hundreds of millions of dollars that financial giants such as U.S. Bancorp have poured into solar financing funds for SolarCity, Sungevity, and SunRun. So far this year, PG&E Corporation, the parent company of California utility PG&E, has created funds totaling $160 million to finance solar leases for SolarCity and SunRun customers. Along with the rest of the economy, venture capital investment in green technology has fallen off the proverbial cliff, according to a survey released Wednesday by market research firm the Cleantech Group. The survey, conducted with Deloitte, found that the size of the average round of funding also crashed, from $20 million in the fourth quarter of 2008 to $12.3 million in the first quarter. Solar captured the biggest chunk of VC cash at $346 million, with the money going to companies like concentrated photovoltaic startup SolFocus and Norwegian polysilicon maker Norsun. “Venture funds continue to invest significant sums, albeit at a slower pace and smaller scale than in the past two years,” Brian Fan, the Cleantech Group’s senior director of research, said in a statement. North America remains the epicenter of green tech investing, with nearly two-third of all of investments in the first quarter. Freescale Semiconductor on Monday is unveiling a new power conversion technology that the chipmaker says will dramatically enhance the efficiency of solar cells and other devices by allowing them to operate at low voltages. That means a single solar cell attached to a mobile phone or other handheld device could charge the gadget. The bigger potential is to maximize the electricity generated from rooftop solar panels. which typically contain a dozen or more solar cells each. When a cloud or a tree shades part of a solar panel, power output from all the solar cells drops because they are linked together. By integrating Freescale’s power converter into each solar cell, those that aren’t shaded can still produce electricity, according to Arman Naghavi, general manager of Freesale’s Analog, Mixed-Signal & Power Division. Sounds geeky but the consequences could be far-ranging, reducing electricity consumption and opening the door to a new generation of solar-powered devices. One big hurdle to using solar cells to power everything from laptops to street lights is that it takes too many of them to produce enough power to be practicable. After all, who’s going to carry around a solar panel to charge their MacBook. Other uses are more sci-fi: self-powered nanosensors that tap the technology to harvest ambient heat or friction in the environment. The converter will hit the market in the second half of 2009. Potential customers include solar cell makers like SunPower (SPWRA) and Suntech (STP) as well as biomedical companies and defense contractors. Freescale, headquartered in Austin, Texas, was spun out of Motorola (MOT) in 2004. Fifty-four billion dollars is nothing to sneeze at, of course. That’s the amount in the $825 billion economic stimulus package – introduced by House Democrats Thursday – set aside for renewable energy, electric car batteries, energy efficiency and other green projects. It’s a start, but that’s less than 7% of the entire stimulus package (or, about enough to pay for the Iraq war for five months, or somewhat more than what the federal government is spending to bail out Bank of America). The lion’s share of the cash is devoted to smart grid technology and transmission lines, with a second big chunk going toward energy efficiency retrofits of public housing and weatherization of low-income homes. That’s good news for a host of startups developing smart grid technology. But the the bill does not address the most pressing issue facing renewable energy companies today: the credit crunch has dried up financing just as billions are needed to fund factories and the construction of solar power plants and wind farms that will be connected to smart grids and new transmission lines. In recent weeks, layoffs have hit the solar industry. OptiSolar – a Bay Area thin-film solar startup that’s building a 550-megawatt photovoltaic power plant to supply electricity to utility PG&E (PCG) – reported to have furloughed half its workforce. And according to The Oregonian newspaper, SpectraWatt, a solar cell maker spun off from chip giant Intel (INTC) last year, has shelved plans for a factory in Hillsboro, Ore. Friday morning, Kate Galbraith at The New York Times’ Green Inc. blog reported that layoffs have now hit the wind industry. The retrenchment comes as utilities are counting on solar power plants and wind farms to come online in the next two years to help them meet mandates to obtain a growing percentage of the electricity they sell from renewable sources. In California, for instance, PG&E, Southern California Edison (EIX) and San Diego Gas & Electric (SRE) have signed more than four gigawatts’ worth of contracts for electricity to be produced by large-scale solar power stations that will cost billions to build. Solar startups rely on a provision that allows them to take a 30% tax credit on the cost of building a power plant. Now most of these companies are startups and have no way to use those tax credits as they’re not profitable. Instead, a solar company must essentially trade the tax credits to a firm that can use them in exchange for cash to finance construction. But investors in these deals have all but disappeared as the financial crisis takes its toll. Which is why solar and wind lobbyists are pushing Congress to make the tax credits “refundable” – meaning those companies that don’t have tax liabilities can trade the credits for cash that can be used to finance power plants. “Due to the recession, projects are now being put on hold, factories are closing and workers face potential layoffs unless Congress refines the tax credits now so they work as originally intended,” said Solar Energy Industries Association CEO Rhone Resch in a statement. $11 billion for smart grid research and development, pilot projects and the construction of new transmission lines to connect green energy power plants to the power grid. The government will fund 50% of the cost of utilities’ smart grid investments. $8 billion in loan guarantees for renewable energy transmission projects. $6.9 billion in grants to state and local governments for energy efficiency and carbon reduction programs. $6.7 billion for renovation of federal buildings, of which $6 billion must be used for energy efficiency retrofits. $6.2 billion for home weatherization programs for low-income families. $2.5 billion for energy efficiency retrofits of public housing. $2.4 billion for carbon sequestration – so-called clean coal – demonstration projects. $2 billion for energy efficiency and renewable energy research (which includes $800 million for biomass and $400 million for geothermal research). $2 billion in loan guarantees and grants for advanced vehicle battery research. But the billions for the smart grid can be considered a down payment: According to an estimate by research firm New Energy Finance, the price tag for modernizing the power grid over the next 15 years will be $450 billion. BERKELEY, Calif. – The Berkeley City Council Tuesday night gave final approval for the nation’s first municipal program to finance solar arrays for homes and businesses. The city’s Sustainable Energy Financing District could accelerate the adoption of rooftop solar by overcoming one of the biggest obstacles to homegrown green energy: the $20,000 to $30,000 upfront costs and long payback time for a typical solar system. Here’s how the program will work: Berkeley will seek bond financing up to $80 million for the solar program – enough to install solar arrays on 4,000 homes and pay for some energy efficiency improvements. For those who sign up, Berkeley will pay for the solar arrays and add a surcharge to the homeowners’ tax bill for 20 years. When the house is sold, the surcharge rolls over to the new owner. For a typical solar system, the homeowner will be assessed an extra $182 a month on her property tax bill. To put that in perspective, the property tax bill on a $800,000 house – your basic middle-class home here if it was bought within the past three years – runs about $900 a month. Electric bills are relatively low in Berkeley due to the temperate climate – Green Wombat’s was $15 in August. The real benefit of the program may come if it is used for solar hot water systems and expanded to pay for energy efficiency measures, such as installing new windows and insulation in Berkeley’s housing stock, most of which dates from the early 20th century. The remaining hurdle is for the city to secure financing at a favorable rate. Once that is obatined, the program. which has won the support of local utility giant PG&E (PCG), should also be boon for solar panel makers and installers like SunPower (SPWR), SunTech (STP), Akeena (AKNS) and Sungevity. The solar program is designed to help Berkeley meet a voter-approved mandate to cut its greenhouse gas emissions 80 percent by 2050.